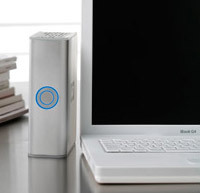 Solve your hard disk storage problems with this sleek and stylish external drive. 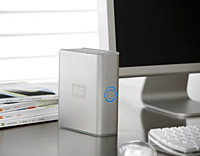 Attractively designed in a rounded sleek metal jacket and sporting a funky blue capacity gauge, Western Digital's MyBook range of external hard drives are aimed at consumers looking for a stylish solution to their storage problems. The drives can be used horizontally or vertically and come in two sizes - 250GB or 500GB, - and three �editions' offering extra features. We reviewed the 500GB My Book Pro Edition which offers three ways of hooking up the drive to your PC; FireWire 800, FireWire 400, and USB 2.0. All leads were provided in the box, and we tested both the FireWire 400, and USB 2.0 interfaces with no problem. Also bundled in the package is the handy EMC Retrospect Express backup and recovery software, with the drive coming with a 3-year limited warranty. Setting up the drive was a cinch: we simply plugged the drive into a USB port our Windows XP machine, and the drive utilities were automatically installed. 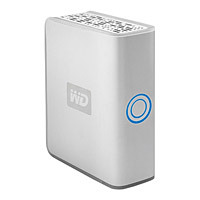 With the drivers installed, we were able to switch to our preferred FireWire 400 connection and the drive was ready for use. As the name suggests, the drive is hardback-sized, and could sit happily on a bookshelf although the glowing blue capacity gauge on the front might look a tad odd amongst the Mills & Boon. We loved the glowing gauge though: it fades in and out when the drive is turned on and off and does a nice little shimmy when in use. The outer ring displays the power/activity functions, while the inner ring is split into six sections which illuminate as the space is progressively used up. It's a nice touch. Lurking inside the 500GB drive is a 7,200rpm drive with a 16MB cache and a quoted seek time of 8.9ms, and we found it very fast in use and had no problems running video files straight off the disk. Right now we can't imagine filling up that 500GB in a hurry, but for drive space demons, Western Digital has recently announced the My Book Pro Edition II, which crams in two 500GB drives in an extended case to give you a massive whopping 1TB of storage - enough for about a zillion photographs (all right, up to 284,000 photos according to Western Digital's figures). Although the drive is quiet in use, you can certainly feel it vibrating if you've got it on the same surface as your machine, so we recommend lobbing it up on to a shelf. 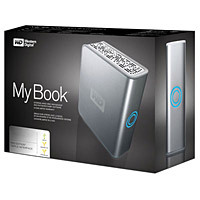 We loved the My Book so much we went out and bought the thing - so now we won't have any excuses to not back up our data. It's a shame that there's no networking option, but with an online price hovering around the �180, the My Book drive still represents remarkable value for money. 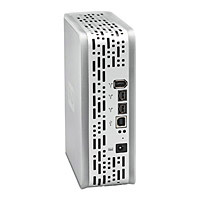 With a choice of three interfaces, we should have no problem using the drive with a variety of desktop PCs and laptops, and unlike many other external hard drives, this one actually looks nice too.